The wind roared outside the house, sounding like a train roaring past the house. Shutters were banging, and rain was spattering against the window. 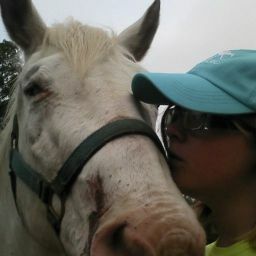 Bucky had already run out and made sure their two horses were secure in the barn, he&apos;d come back in soaked to the bone. Bucky and Willow were cuddled up on the couch, beneath a pile of blankets. The storm raged outside, but inside everyone was warm and cozy. Bucky was sitting on the corner of the couch, with Willow laying across the couch, leaning against him. Their black dog Sirius-whose black fur had long since gone gray with age- was buried under a blanket and shivering. Sirius never liked storms, he&apos;d always had to snuggle up with someone whenever there was a storm. Since it was pouring outside, Bucky had found their barn cat, Sebastian, and brought him inside. Sebastian was perched on the back of the couch. Their new puppy was wrapped in a blanket like a burrito in Willow&apos;s arms. She was a fuzzy white Alaskan malamute puppy, with a black star around one eye. The house shook with wind again, and Willow glanced around. 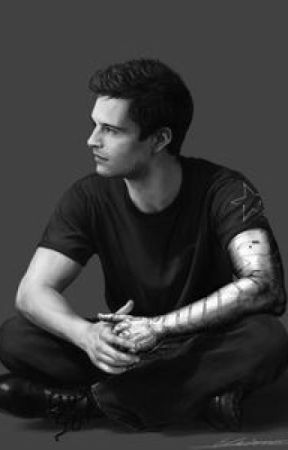 "It&apos;ll be fine," Bucky said reassuringly. "Besides, if the heat goes off, we have the wood burning stove, and these two little balls of fluff to keep us warm." The lights flickered and went out. "Power&apos;s gone," Willow said flatly. "So it is, but luckily we were prepared," Bucky said, leaning forward and lighting several candles that were resting in their holders on the coffee table. The candles sent cheery yellow light dancing along the walls. "Ahh, candles. They work for romantic evenings, power outages, and of course cult sacrifices," Willow laughed. "Well, lucky for us it&apos;s the power outage option and not a cult sacrifice," Bucky grinned, "Though of course it could also be option 1, and turn into a romantic evening." "We are laying on a couch, wearing pajamas, and surrounded by furry mammals." Willow kissed Bucky&apos;s cheek gently, "I love you too." Bucky leaned down to kiss Willow back but she leaned away, "And as much as I&apos;d love to kiss you right now, my back is really hurting so we&apos;re going to have to move." Standing up, Bucky let Willow scoot over and lean back against the couch, before sitting back down next to her. There was a thunder clap outside and Willow jumped slightly, pushing Bucky over, and the next time thunder lit up the room, Willow was on top of Bucky, and they were both laying on the couch. "Greetings friend. Isn&apos;t this nice?" Willow said softly, letting her head rest on Bucky&apos;s chest. "Yes, this is very comfortable, my back feels much better. Just stay like this for a while." Bucky wrapped his arms around Willow, closing his eyes. There was a thump as Sirius jumped up onto the couch next to them again, and their puppy Lael wriggled her way next to Bucky&apos;s pillow on the couch. Bucky counted to five, and then there was a smaller thump as their cat Sebastian curled up on Willow&apos;s back. "Now our little family is complete," Willow whispered, closing her eyes. "Yes it is," Bucky sighed. They fell asleep that way, a pile of arms and legs, with a dog at each end of the couch and a cat sitting on top of them like a cherry on top of a sundae. Happy as clams.